We begin almost all projects with a conceptual budget to start with a realistic cost basis. These conceptual budgets are used to help determine the scope of design and differentiate between wants and needs. We tailor design to the conceptual budget early on in order to keep projects realistic. As design progresses, and a scheme is developed, we begin matching elements to budget line items for reasonable costs. By abiding by this process from the start, we are able to determine what areas of the budget may fluctuate and what is fixed. This then can inform our design work, helping us understand what components of a project can be developed and what components must be simplified. Our budgets include “hard” construction costs and “soft” costs such as our rates, expediting and filing fees. Conceptual budgets aim to provide a complete view of all costs associated with a project. Our projects are designed using three dimensional “Building Information Modelling” that allows us to illustrate our designs spatially, and to extract accurate material take-offs. This information can then be inserted back into the project budget forming a feedback loop, and solidifying the budget. Additionally, early in projects we bid portions of the work to sub-contractors to obtain actual costs based on design. We often bid early to electrical, mechanical and plumbing as these trades often drive much of the budget. Through our use of BIM we are able to provide our subs with accurate information about scope, which in turn allows them to provide us with accurate costs. As MS—A develops the design into construction drawings, MS—B will assemble costs for all portions of the job. Bids from multiple sub-contractors will be obtained, and costs for materials and construction elements will be priced to create a “Control Estimate” for the work at the start of construction. Clients are involved in the decision process for the control estimate in the same way clients interact with us and the design. When there is a choice about a particular trade, we will include the client in that decision, outlining relative costs versus subcontractor strengths and weaknesses. Finding the correct sub for each project is important and requires input from clients and builders alike, for all subs vary in tiers of skill and cost. As subs are selected they are identified in the estimate and schedule. In the same way that we develop the control estimate we look at a realistic project schedule. Since we are both the architect and GC we are able to construct a complete project schedule that includes the design, approvals, construction and close out timelines. While a finished project is never executed in the way a schedule is written, it is critical to understand key milestones and the ways different trades interact to keep a project on time. As with budgets, schedules are revised throughout design and construction. Just prior to the start of construction the Control Estimate is published by MS—B and agreed to by the client. The estimate is inserted into a project specific QuickBooks accounting file and used to track budget amounts against actual expenses. During construction every expense is accounted for in QuickBooks. On a monthly basis we provide a “Budget versus ActualS” report, listing expenses by category. Our projects are run as an open book, and our clients see the actual costs paid directly to subs and vendors. Each month we project the costs we anticipate will be spent, and request that amount from the client. 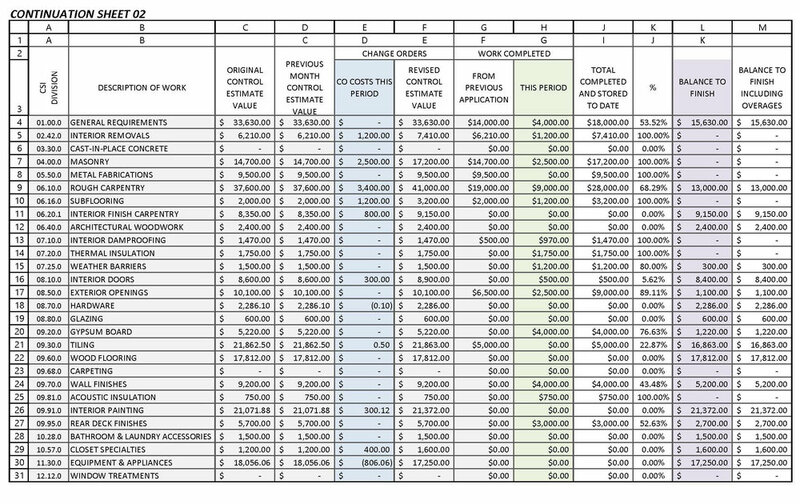 A Continuation Sheet is prepared that corresponds to the budget categories, and shows the specific amounts requested for the application period. 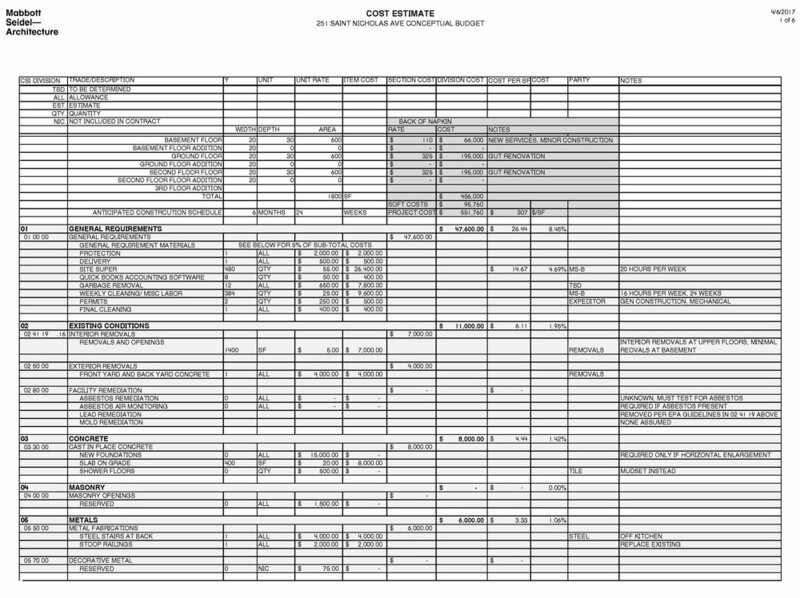 In addition, the continuation sheet shows the original Control Estimate value, any additions or deductions made, and the revised Control Estimate value. This enables us to track the original cost estimate against any changes to the cost during construction. All adjustments are reviewed with owners in a transparent manner and cost back-up, such as invoices and receipts, can be provided.